Tumbler Ridge is located 90 km (56 miles) southeast of Tumbler Ridge. Leading off of the highway are access roads to Sukunka Falls Provincial Park, Gwillim Lake Provincial Park and Bullmoose Mine. 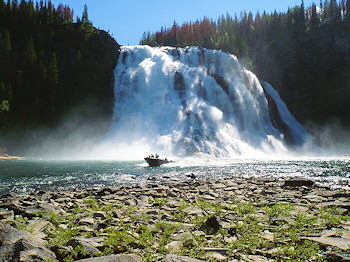 Situated on a plateau with Bullmoose and Quintette Mountains in the backdrop, Tumbler Ridge is a good base from which to enjoy the year-round fishing, hiking, boating, snowmobiling and cross country skiing in the area. Bullmoose & Quintette Mine Tours: These two mines employ the majority of the town's population. Visit the Infocentre at Southgate and Front Streets for more information. Access is via the Murray River Forest Service gravel road, 60 km (37 miles) from town. 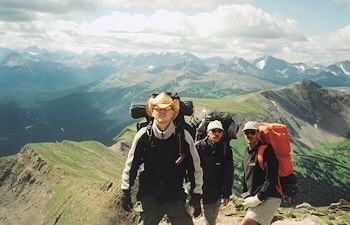 There is excellent wilderness camping and hiking within the park. Monkman Expeditions - Join us for world-class hiking, canoeing, and river boating adventure expeditions in the Monkman Pass region of BC's Peace River. You'll experience the untouched wilderness of the Rocky Mountains in Monkman Provincial Park and area -- a place like no other. You can return to Chetwynd via Highway 29 or take alternative routes back to Highway 97. This 98km (60 miles) paved highway meets Highway 97 17km (11 miles) west of Dawson Creek at Arras. This gravel road runs east then north for approximately 145 km (90 miles) from Tumbler Ridge to Highway 2 at Tupper, on the BC/Alberta border. From Chetwynd to Fort St. John, Highway 29N passes by the small community of Moberly Lake, onto Hudson's Hope, the WAC Bennett Dam and the Peace Canyon Dam. Before arriving at Hudson's Hope you will cross over the Peace River on it's only suspension bridge. This is the second largest hydroelectric project (the WAC Bennett Dam is the first) on the Peace River. It is located on the east side of Highway 29 before Hudson's Hope. Situated above the Peace River, Hudson's Hope is located on Highway 29, 64 km (40 miles) north of Chetwynd. It was first established in 1805 as the Rocky Mountain Portage by Simon Fraser. With displays of gold mining equipment and early trapping and pioneer artifacts, this museum is located at 105th Avenue. Access to the Bennett Dam is via the Dam Access Road off of Highway 29. The viewpoint is located 22 km (14 miles) from the highway and offers excellent views of the dam and the mountains and surrounding area. It is located on Williston Lake and is BC's largest reservoir. Offering free guided tours of the powerhouse. The visitor centre provides information about the areas natural history and includes a life-size dinosaur replica and casts of footprints which were found during the construction of the dam. Continuing along Highway 29N is the Halfway River located halfway between Fort St. John and Portage Mountain with good grayling, whitefish, Dolly Varden and rainbow trout fishing. The junction of Highways 97 and 29 is located just past Bear Hill, 13 km (8 miles) north of Fort St. John.